We mentioned in our last article, Give Your Kids the Gift of Gardening for a Healthy Lifestyle, that kids love to help in the garden by planting, watering, and picking their fruits and vegetables. Getting them involved in the garden and kitchen encourages kids to eat healthier by trying vegetables/fruits that they would generally not try. Here is a kid-friendly recipe snack, that is also a garden-to-kitchen recipe. Together you can pick the celery and prepare the nutritious snack. 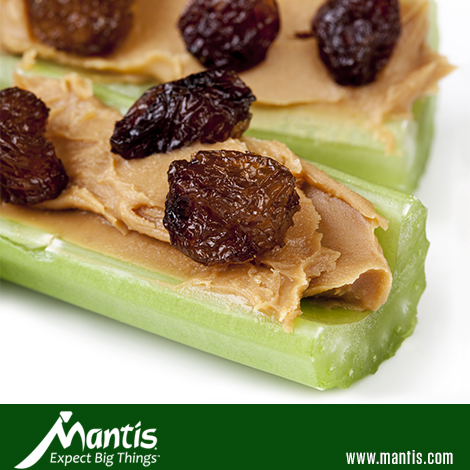 Ants on a log… a classic hit! Wash and dry the celery you’ve picked from your garden and cut the stalks into 3 pieces with the hollow side facing up. Spread the peanut butter (or a spread of your choice) into the hollow part of the celery; sprinkle with cinnamon; and arrange the raisins on top. If your child is allergic to peanut butter, here are some alternatives: yogurt, cottage cheese, or cream cheese as the spread. Get creative and have fun with this super easy recipe!